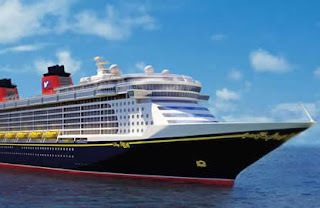 Check out SailDisney.com for the latest in Disney Cruise News! I think it is safe to say that I have been bitten by the Disney cruise bug. I recently returned from a girls only weekend getaway on the Disney Dream. In a few weeks I will be lucky enough to check out the Disney Fantasy on a preview cruise before the inaugural sailing. A week after that I will be taking the husband and kids on the Disney Dream for a Spring Break cruise. I am all boned up with Disney Cruise knowledge to share, so I have joined forces with some of the other members of the TMC Travel crew and we are launching SailDisney.com today! Our goal is to provide you with all the latest news, tips, and tricks for all things Disney Cruise. I will share some of my cruise experiences over here, but in a more limited manner, as this little corner of the web is reserved primarily for my Disney World obsession. 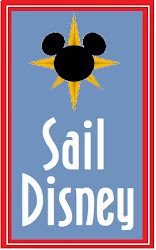 For those that are interested in reading a little more about cruising, please hop on over to Sail Disney. Oh...and be sure to like The Mouse Connection and Sail Disney on Facebook! We have some great giveaways on the way, so stay tuned! Disney diehards have long been aware of Disney's official unofficial FastPass policy, namely to honor a guest FastPass anytime after the return time printed on the ticket. This policy would allow guests to squirrel away FastPasses during the less crowded morning hours and then ride them whenever it was convenient (or crowded) later in the day. As of March 7, 2012, a new FastPass policy will go into effect. The new policy will more strictly enforce return times. The new policy will allow guests to ride as early as 5 minutes before their window opens, which will hopefully alleviate some of the milling around in front of attractions for those that arrive a little early. The policy will also allow a 15 minute grace period for the stragglers. As you can imagine the Disney-geek universe is buzzing about the changes. The strict rule followers feel are either neutral to the changes or even happy to have a level playing field. Those that have always taken advantage of the never closing window feel slighted. After all, the current policy for the most part works and people are happy. Why mess with it? No, really. Why mess with it? Most think the answer lies with the rumored Next Gen / X-Pass initiatives. While much of the NextGen stuff sounds SUPER cool (read more here), the X-Pass concept (think premium FastPass) is getting a much more luke warm reception. Theme Park Tourist has a harsh, though not unfair critique here. I am anxious to see how the X-Pass is actually implemented. I am not a fan of creating a class based Disney park experience based on how much you are willing to spend. Although I have no problems creating a "class" based system between folks who are willing to do a little research for their trip before they go. I always am amazed at the people willing to wait in line 90 minutes for an attraction that has FastPass open and available. If they had done even 30 minutes of reading they would know that FastPass (in it's current incarnation) is free and fantastic! But I digress...back to the implications of the anticipated policy change. So here are some issues that are bound to come up. ADR's - If you get held up waiting for Pooh to visit your table, or if you have an unusually long time to wait to be seated you could miss your window. So make sure you pay attention to the return times before you grab the FastPass....any allow for things to go wrong. Unexpected Delays - What happens if you get stuck on Splash Mountain for 45 minutes? By the time they get you off, your window may have closed. Will there be some sort of grace period? Unexpected Downtime - What happens when the ride that you are holding a FastPass goes down? I can only assume that they will give you a open pass to return anytime later in the day? Bad Manners will abound - Can you imagine the poor cast members that are going to have to explain the policy. "I know that you have arrived late for every FastPass you ever had, but now you can't. Now you must wait 95 minutes to ride Toy Story Mania standby or you are out of luck." As badly as I feel for the verbal assault that that castmember is going to take, I will feel equally as bad for the FastPass holder immediately behind that guest who just wants to get on the darn ride! I am going on a Disney Cruise! Hi friends! First of all, let me apologize for the long break. Life has just gotten in the way. It seems that as soon a folks pack up the last holiday decoration they are ready to think Disney for spring! And who can blame them - I have the Disney Dream on my mind. First of all, I have the best job ever. 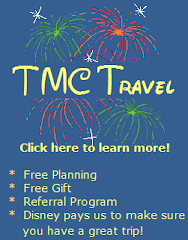 Helping people plan vacations is just plain old fun....and the fact that Disney pays me to do it is even better. If there is any downside to my job, it is that I have to do a lot of talking...and after awhile I am truly sick of my own voice. So after a fabulously busy and productive January (in a good way!) I am sneaking off to Disney with a girlfriend for a 3 day cruise on the Dream. It will be my first sailing on the Dream (she just celebrated her first birthday, you know!) and I am beyond excited. My girls were a little annoyed that I was leaving without them, but when they realized that that meant they had their favorite manservant (their father) at their beck and call for the weekend, they decided it was not so bad after all. So they are sending me off with their blessings. I am trying not to take offense. So what am I looking forward to the most? Fabulous company aside, I am looking forward to ridiculously sweet and expensive cocktails served in the DCL hurricane glasses as we leave Port Canaveral. I am anxious to see what my friend Crush has been up to at Animator's Palate. I am ready for the warmth of sunshine on my face and sand between my toes - even if it means that there is a bathing suit involved. I am hoping that the water is warm enough for some snorkeling on Castaway Cay. I am anticipating a delicious dinner in the relative peace of Palo. I want to wander around the Straw Market in Nassau to find some treasures to bring home to my babies and the hubs, whom I will miss terribly. As for said babies and the hubs....they will get their time on the Dream in April. I am excited to be able to take 2 cruises in such a short period of time wearing two different hats. This cruise is all about the grown up stuff, I want to try a mixology class, check out Serenity Bay and all there is for grownups to do. Next time it will be about the kids - the characters, the clubs, the pools. This trip is an oceanview stateroom, on deck 2...next is a veranda on deck 8. This trip we are flying in and out and pushing the time limits to do so. The next we will drive and check out a hotel near the port. This trip is 3 days...is it enough? Next trip is 5...will it be too much? I will find out and let you know! I have a lot of work to do as soon as I land in Orlando in only a few short hours. I know, I know...It is a tough job. But by know you know that my dedication to my job is boundless! :) Also, keep checking back for news about our new blog dedicated to Disney cruises. It will be launching soon!